In biblical times, Asclepius was widely worshiped as the god of healing. As we continue our view down the southern slope of the Athenian acropolis, we can see the remains of the sanctuary of Asclepius. Sanctuary of Asclepius, the god of healing. Athens, Greece. Photo by Leon Mauldin. Fant and Reddish observe, “Above the Stoa of Eumenes, and to the left (west) of the Theater of Dionysus, can be seen the scant remains of the Asclepeion, a center for healing run by the priests of Asclepius. The sacrificial altar remains, but it is difficult to discern amid the various stones currently being stored there” (A Guide to Biblical Sites in Greece and Turkey, p.26). (We should note that when they say “left” it is from the perspective of one who is down from the acropolis. 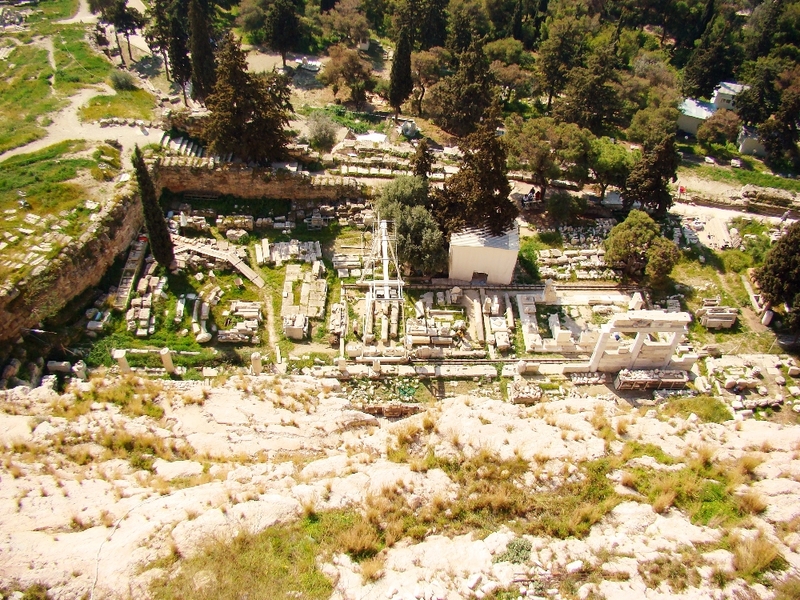 When you’re on the acropolis looking down, the sanctuary would be to your right of the theater of Dionysus–LM). We have previous written on Asclepius here and here regarding the famous healing center at Pergamum. Even in Israel there was a temple devoted to this god. On a narrow terrace above the Stoa of Eumenes, directly under the steep south face of the Acropolis, is the Asklepieion, the sanctuary of the healing god Asklepios, whose cult – initiated largely by Sophocles – was brought to Athens from Epidauros in 420 B.C. The sanctuary is centered on two sacred springs. The earliest part of the sanctuary lay at the western end of the precinct, where there are the foundations of a stoa and a small temple. A number of herms have been brought together in the stoa. At the west end of the complex is a rectangular system with polygonal walls dating from the same period. To the south is a later cistern. The buildings in the eastern part of the precinct were erected about 350 B.C. Immediately under the Acropolis rock, here hewn into a vertical face, is a stoa 50m/165ft long, originally two- storyed, designed to accommodate the sick who came here to seek a cure. Associated with it is the cave containing a spring which is still credited with healing powers; and accordingly the cave is now used as a chapel. Parallel to this stoa, which was rebuilt in Roman times, another stoa was constructed, also in Roman times, on the southern edge of the precinct; of this second stoa some remains survive. Both stoas faced towards the center of the precinct, in which stood the temple. This was oriented to the east and had four columns along the front (prostylos tetrastylos). The foundations of the temple and the altar which stood in front of it are still to be seen. In early Christian times a basilica was built over the remains of the temple and the altar, and some architectural fragments from this can be seen lying about the site. Many of the sites in ancient Athens are world renown. The Parthenon, for example, was one of the Seven Wonders of the World (see our previous post here). Other sites are not as well known. Looking down the south slope of the acropolis you can see the remains of the small temple of Themis, seen here at center of photo. Temple of Themis in Athens, Greece. Photo by Leon Mauldin. Themis was an early bride of Zeus and his first counsellor. She was often represented seated beside his throne advising him on the precepts of divine law and the rules of fate. We have several other posts on ancient Athenian temple and other sites, here, here and here. Use the search box at top of home page. Click image for larger view. 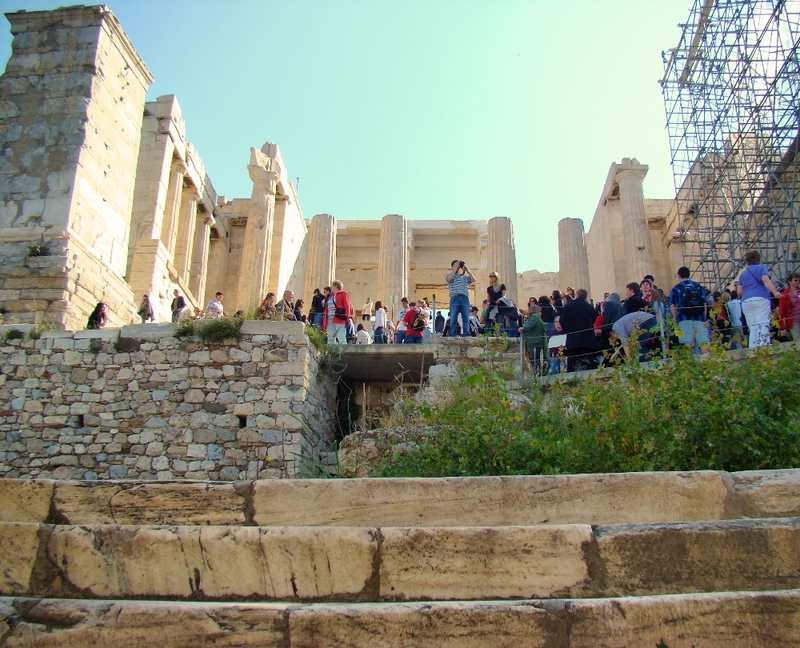 The Propylaea (entrance before the gate) still stands as the access to the Acropolis today. This monumental entrance gate was commissioned by the great statesman and builder of the Acropolis, Pericles. Construction was begun in 437 B.C. Propylaea leading to Athens Acropolis. Photo by Leon Mauldin. The Propylaea (“before the gate”) visible today is the fourth of such structures to be built at this site; earlier ones were destroyed in various wars. The road from the agora below, the Panathenaic Way, led up to this point. A flight of marble steps ascends to the hall of the Propylaea. One step is of gray Eleusinian marble; the others are of white Pentelic marble. The monumental pedestal (25 feet tall) on the left of the steps originally was designed for a statue with a chariot and four horses to honor King Eumenes II of Pergamum for his contribution of the Stoa of Eumenes. Later it was reinscribed with a dedication to Marcus Agrippa in honor of the odeion he contributed to the agora. Designed by the architect Mnesicles and begun upon the completion of the Parthenon (437 B.C.E. ), the Propylaea consisted of a central section with five doorways, originally fitted with wooden doors, and projecting wings on either side. The wing on the left side, the north wing, was known as the Pinakotheke, or art gallery, because of the magnificent collection of paintings inside. In 150 C.E. Pausanius named a number of the paintings he could recognize, including some by Polygnatus of Homer (5th century B.C.E.). The room was used for official banquets by dignitaries who reclined on couches in the Greek fashion. The wing on the right side, the south wing, could not match the other in design because of the Temple of Athena Nike and other buildings that impinged upon it. This wing was never completed due to the start of the Peloponnesian War (431 B.C.E.). (A Guide to Biblical Sites in Greece and Turkey). We are looking forward to seeing Athens again in a couple of months. You are currently browsing the Leon's Message Board blog archives for January, 2015.